Binghamton received a visitor on Tuesday as Congressman Paul Ryan (R-WI), speaker of the U.S. House of Representatives, campaigned for Congresswoman Claudia Tenney (R-NY). Tenney, who represents New York state’s 22nd congressional district, is facing re-election against Democratic candidate Anthony Brindisi. The seat is one of several across the country that could flip to a Democrat, possibly giving the party a majority in the House of Representatives. Ryan’s visit to Binghamton is his second stop on a campaign tour consisting of 26 appearances in 12 states over the next three weeks. The tour aims to bolster support for Republican candidates facing close races in their districts. The event, held at Terra Cotta in Downtown Binghamton, was closed to the press and public. However, Ryan’s appearance in Broome County was met with protest. Roughly 40 community members gathered on State Street to voice their opposition to Ryan, Tenney and the Republican Party. The protest, spearheaded by Citizen Action of New York’s Southern Tier chapter, began approximately 45 minutes before Ryan’s arrival. 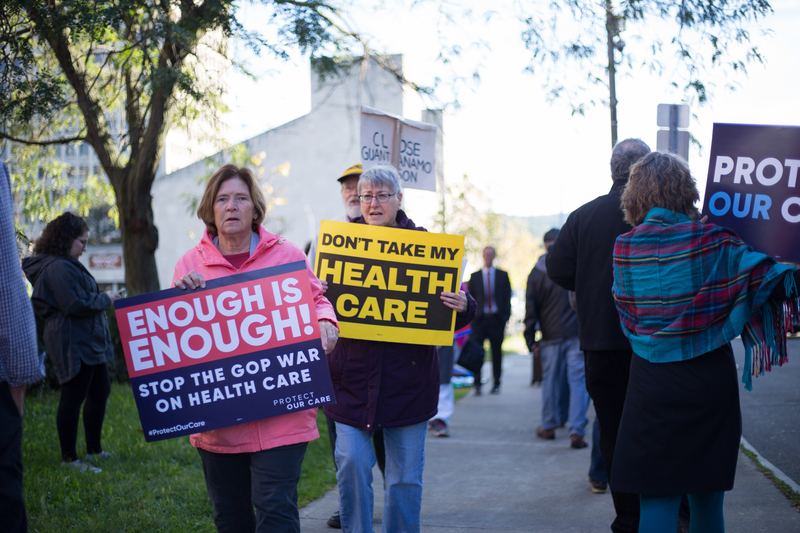 According to Mary Clark, regional director for Citizen Action’s Southern Tier chapter, the protest was intended to give people an opportunity to express their dissatisfaction with the policies Tenney and Ryan support. 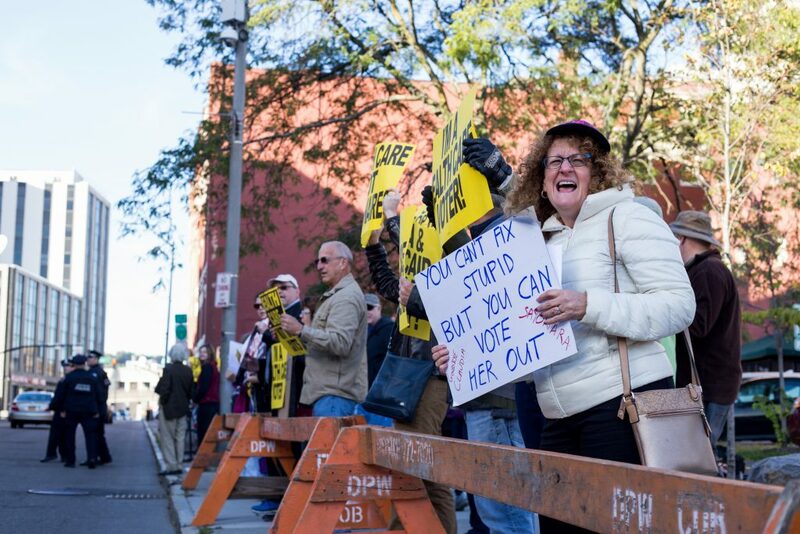 Protestors hold up signs outside Terra Cotta in Downtown Binghamton on Tuesday, where Congressman Paul Ryan, speaker of the U.S. House of Representatives, campaigned for Congresswoman Claudia Tenney. Some protestors walked up and down State Street with signs advocating for universal health care and opposing tax cuts for the wealthy. Others stood behind orange barricades set up by the Binghamton Police Department (BPD). According to David Baer, sergeant of BPD’s Community Response Team, police were present to ensure the safety of protestors and event attendees. While protestors marched, officers kept them out of traffic. Protestors also chanted slogans such as “One, two, three, four, Claudia Tenney’s out the door,” “Paul Ryan is not welcome here” and “Tenney, Tenney, you’re no good, never voted like you should.” Alex Glazowski, a protestor at the event and a senior double-majoring in political science and history, was marching with his father in mind, a truck driver who has been laid off three times because of economic downturns. 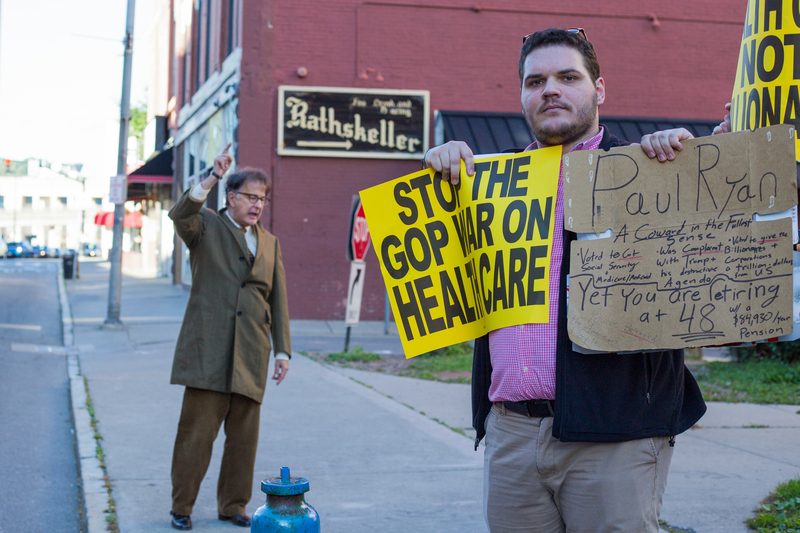 Protestors call for universal health care while demonstrating against Paul Ryan, speaker of the U.S. House of Representatives, and Congresswoman Claudia Tenney on State Street on Tuesday. Glazowski said with Ryan in Binghamton, there was no excuse for him not to be present. Others, like Ralph McGrew, 72, of Binghamton, also came to express their dislike for Tenney. McGrew said Tenney is the worst congressperson Binghamton has ever had. “She believes in conspiracy theories, she says that beating your wife does not reveal a character flaw, she votes the wrong way on everything and the laws that she sponsors and supports, [like] selling gun silencers to everyone who wants them, are just awful,” McGrew said. The protest also attracted a counter-protestor — John Solak, 65, of Binghamton, who began shouting at protestors during the demonstration. Solak said although he doesn’t support Tenney or Ryan, he is against the protestors’ message of universal health care and increased taxes on the wealthy. As Tenney and Ryan arrived at the event, neither spoke to protestors. However, on her way into Terra Cotta, Tenney laughed and clapped her hands along with protestors. Roughly an hour later, both politicians left, with Ryan heading to New York’s 24th congressional district to campaign in support of Congressman John Katko. Bridget McCusker contributed reporting to this article.